It is my honor this month to be the host kitchen for the Bread Baking Babes for the first time. I had a few recipes in mind, but in consideration of the usual hectic schedules this time of year, I decided to go with something hearty and a bit more practical. This month we have made Pain Bouillie or Rye Porridge Bread from The Village Baker. It does have an overnight soak for the porridge, but the dough comes together easily and goes into a cold oven, so in all it is fairly simple. Our recipe comes from a great book that I purchased after doing another recipe with the BBB as a buddy: Korni Bread. 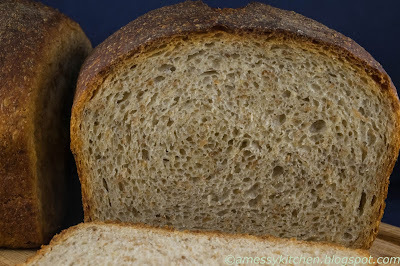 I love a rye bread that is not quite so dark and dense, though this one has a delightful texture, both chewy and moist. This is more like the rye breakfast toast you might generally find in a typical American restaurant, which I am quite fond of though this is so much better, being home baked. Freshly cooled, the crust is crisp and very chewy! It makes great bread for soups and stews, and fabulous toast. I'm sure it would make lovely savory sandwiches as well, I know some of the other babes made delicious sounding versions with Boursin and smoked trout or salmon, and perhaps a Reuben or two. "Whenever you see a French recipe that begins with the instructions "Faire une bouillie..." you know you have come across a very old recipe because it starts off with a mush made by pouring boiling water over flour. 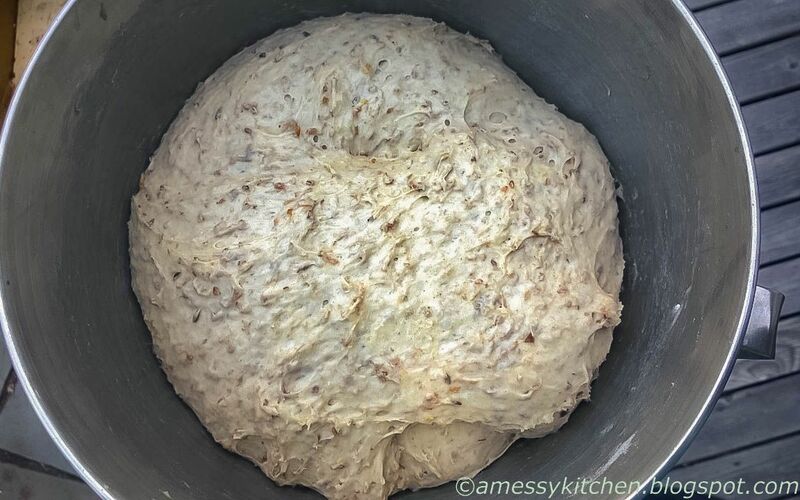 The mush, which will ferment slightly overnight, is used the next day mixed into a bread. The most fascinating recipe I have heard of for pain bouillie is one from the Alpine region of France around the town of Villar-d'Aréne. The bouillie is made with dark rye flour and set aside to rest for seven hours. 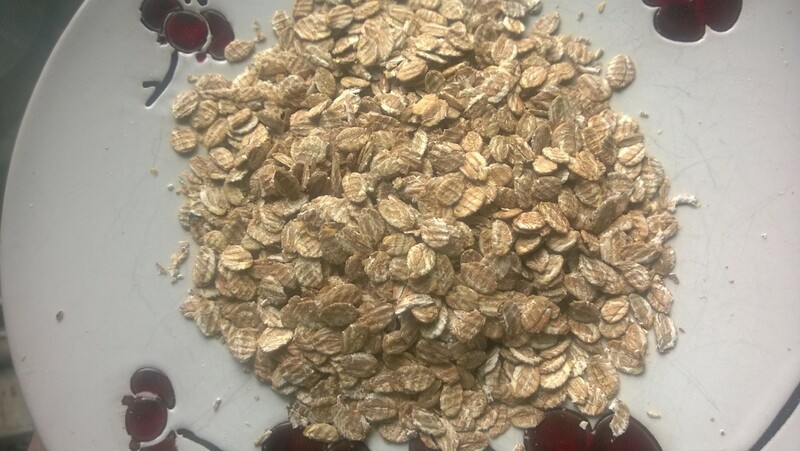 The porridge is then mixed into a dough, without any yeast, and allowed to rest for another seven hours. When the dough is finally made into loaves, they are placed in an oven that has already been used for bread and so the temperature is only about 200ºF. 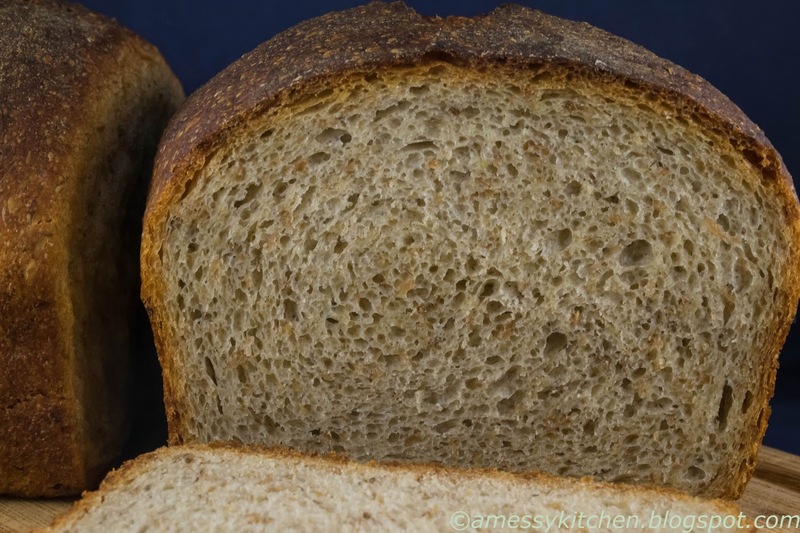 The loaves bake for seven hours and the process produces a moist, dense, completely sourdough bread that lasts well over six months - or so the story goes. The bread is traditionally made in November and it keeps best when stored in wine cellars and hay lofts." I think many of us also ended up adding more flour than the recipe calls for. I added quite a bit more due to spelt's hydration preferences, but still ended up with a nicely sticky dough, typical of rye. I have adjusted the recommended flour from 2 cups to 2-3 cups to accommodate that experience. My version of the book only has the volumes in cup measurements, but some of our other Babe Bakers linked on the right, have awesomely figured out the weights and metric equivalents. This is a wonderful bread and we would love for you to bake along with us! Just bake your version of this bread by November 30th and send me a note with your results and a picture or link to your post at eleyana(AT)aol(DOT)com with Buddy Bread in the subject line and I will include you in our buddy round up at the beginning of next month and send you a badge to keep and/or add to your post. You don't have to have a blog to participate, a picture is fine! To make the porridge starter (bouillie): Mix the honey into the boiling water until dissolved. 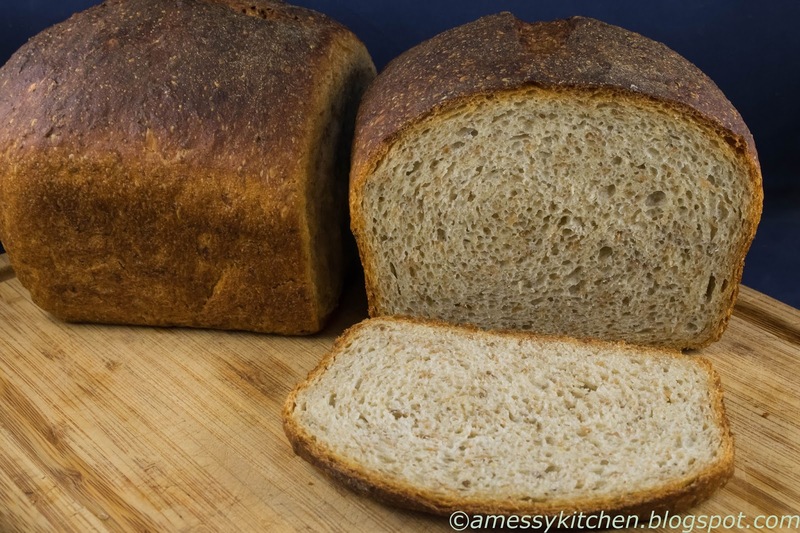 Pour it over the rye flour and grain in a bowl. Let it soak for a few minutes, then give it a stir to make sure all the flour is moistened. Cover the bowl and set aside overnight in a warm area. For the dough: Dissolve the yeast in 2 tbsp of the warm water. Put all of the porridge (bouillie) into a medium bowl or stand mixer and mix in the salt. Crush the caraway seeds with a mortar and pestle until fragrant and broken. Add the raisins and grind into a paste. Stir the last 1 tbsp water into the caraway/raisin paste. Add 2 tsp of the resulting caraway flavoring into the porridge. (I added ALL of it). Slowly add 1½ cups flour, mixing in on low speed or with a plastic dough scraper. Mix in the yeast. Continue adding the remaining flour slowly until the dough is a medium firm consistency. Knead for 5-8 minutes, adding a little more white flour if necessary. The dough will be sticky but should be firm. 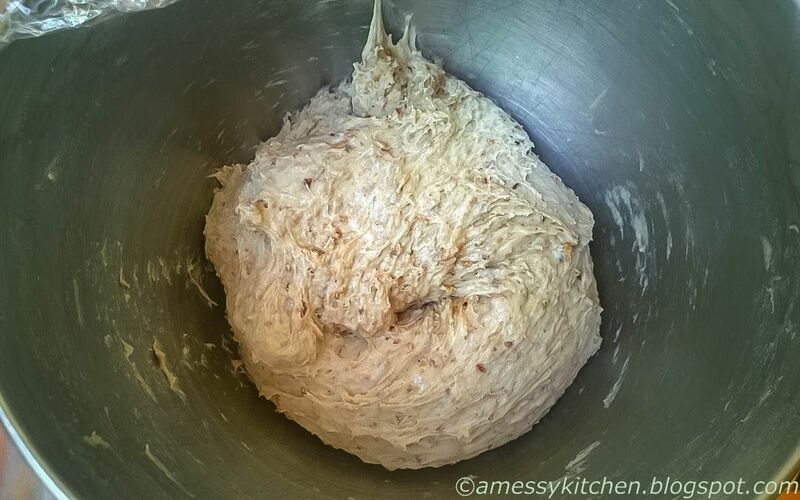 Put the dough in the bowl, cover with a moist towel, and let rise in an unlit oven (or warm place) for 1½ - 2 hours. 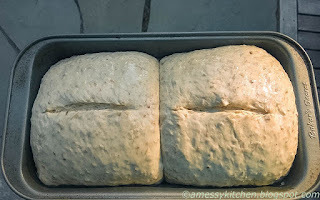 When the dough has doubled, cut into two pieces. Shape into flat loaves that are 5" square and 2" high by flattening and then folding the edges toward the middle and sealing the edges with the heel of the hand. Grease a 9x5½" bread pan and oil one side of each loaf. Place them together in the pan with the oiled sides touching. Cover again with a moist towel and let rise for 30-45 minutes in a cold oven until the dough has crested the edge of the pan by ½-inch. 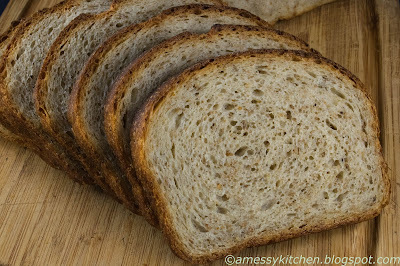 Slash the top of each loaf with a little 2" cut, and brush tops with oil. **Update: Here is my result starting in a not fully preheated oven (200ºF) and using steam via bowl of water and spritzing loaf with sprayer, turning up to 425º immediately and baking 15 minutes. Then turning it down as written and baking another 20 minutes until done. I also gave the loaf some time directly on the rack after I took it out of the pan. Results: thinner crust and better oven spring! Cool on a wire rack and slice thinly when bread is completely cooled. Love the crust on your beautiful loaf. Mine is rising...will be posting late in the day I think. 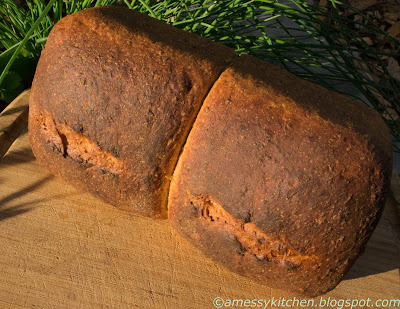 Such a great idea to make a rye bread with a porridge as a starter. Thanks for choosing this recipe for your first one. I can tell we will be looking forward to the recipes you choose in the future. What wonderful loft you achieved with yours. 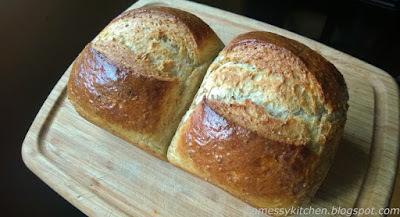 We loved this bread, Kelly, even though I managed not to follow all the directions. I really must try this again with the raisin/caraway paste! Maybe I'll even put the shaped rounds into a loaf pan. ...if I can remember. Many thanks for making such an excellent choice this month. In spite of the gummy interior, I did enjoy this bread. I believe I found a shop that sells cracked rye, so I intend to replenish my supply and try again. I also ended up adding quite a bit more flour. 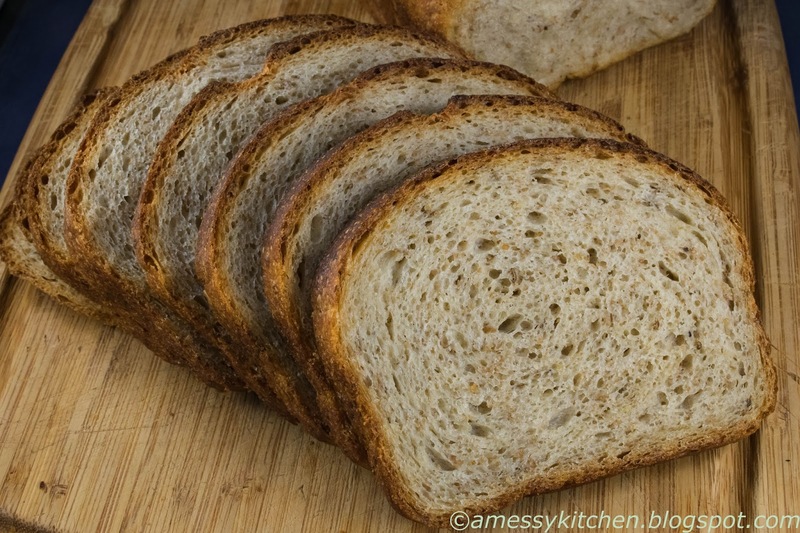 Thanks for choosing a rye bread. 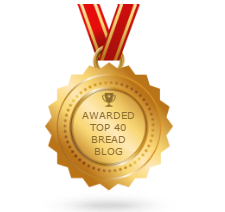 Thanks so much Kelly for helping me flex new bread baking muscles! Great choice! 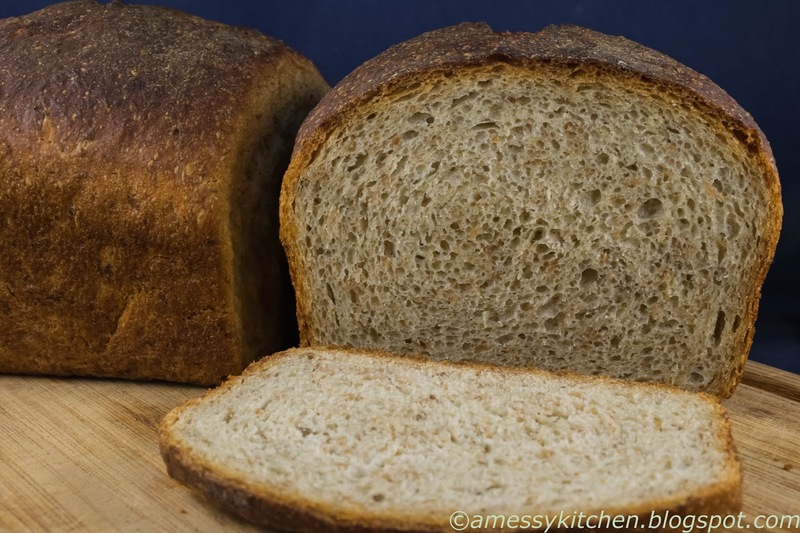 Your crumb looks really airy and light! I didn't read the recipe well and just put the bread in a preheated oven. I'm glad I did, reading that a cold start gives it a thicker crust. Thanks for your choice this month!